Would you look at that? I made Christmas-colored pasta, completely on accident. I’m on a perpetual roasted broccoli and red bell pepper kick, you see, and got a hankering for some hearty pasta. Here, freshly roasted broccoli and bell pepper collide with lots of delicious sautéed spinach, my favorite whole wheat linguine and some balsamic vinegar. Toss all that together with some magical reserved pasta water for a light, silky sauce, and we end up with high-contrast Christmas pasta. I love it. This spinach pasta recipe is highly adaptable. Feel free to change up the roasted vegetables—just use whatever you have around, cut to similar sizes and roasted until tender. 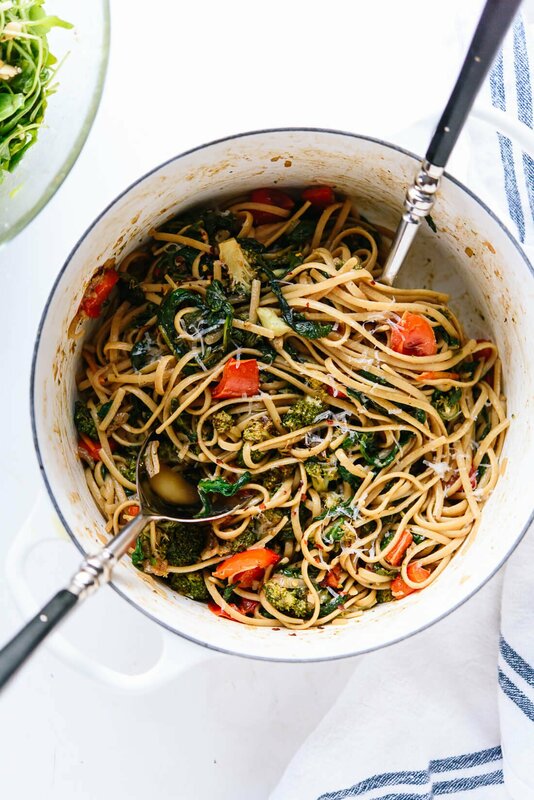 Or, skip the roasted vegetables for a very simple but very flavorful and hearty spinach pasta. The recipe is easily made vegan and/or gluten free, and the leftovers are great, whether served chilled, at room temperature or warmed again. My one request is that you serve this pasta with a great green side salad. 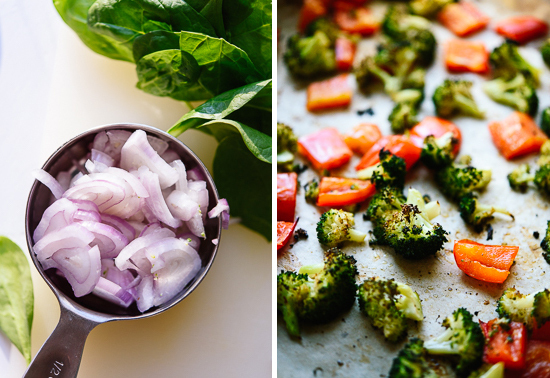 It can be super simple with just fresh greens, your favorite dressing and a couple of add-ins. Just don’t skip it! 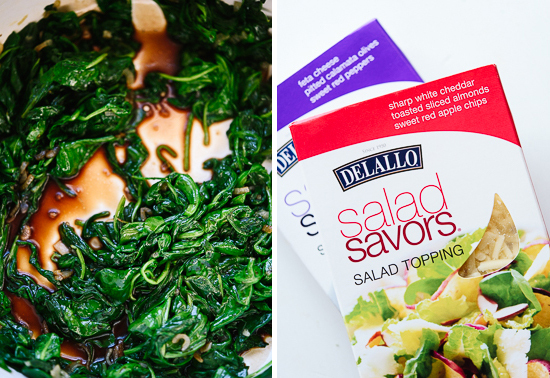 DeLallo, the makers of my favorite 100% whole wheat pasta, offer a product called Salad Savors that combine a few complementary salad mix-ins in one easy-to-grab package. My fridge is full of Salad Savors right now, so I have no excuse not to include a side salad with each meal. The more greens, the better, especially during the holidays! I had a hard time choosing which Salad Savors to use with this pasta, but ended up grabbing my favorite (called Crisp), which includes sweet red dried apple, shredded sharp cheddar cheese and toasted almonds. I just tossed those ingredients with fresh arugula and a simple, homemade balsamic dressing. It was remarkably easy and delicious. Please let me know how this recipe turns out for you in the comments. I’m always so eager for your feedback, and hope you love my recipes! 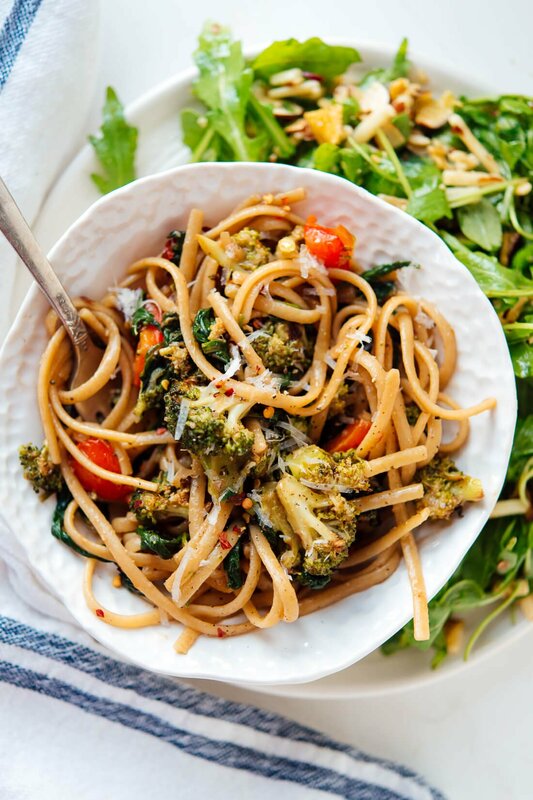 This healthy vegetarian pasta features loads of spinach and roasted vegetables tossed with light balsamic sauce! 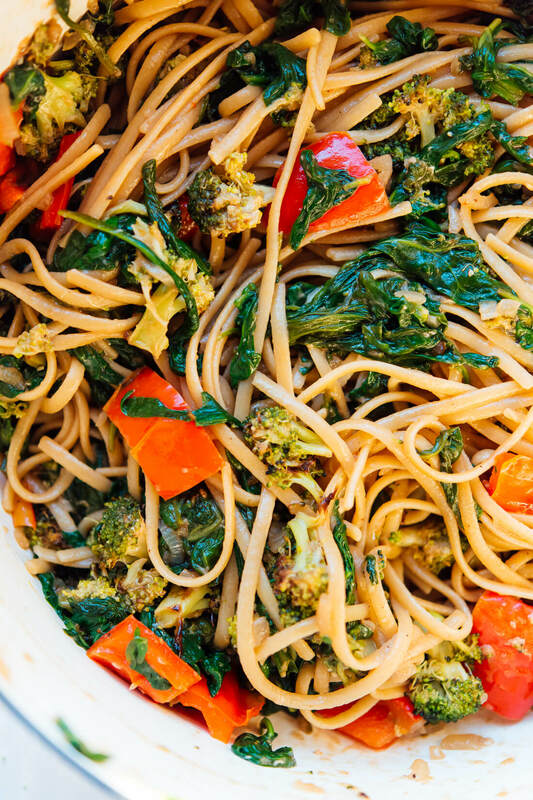 Feel free to change up the vegetables or skip them completely for a simple, hearty spinach pasta recipe. Recipe is easily vegan and gluten free (see notes). Serve with a green side salad for a complete meal. Recipe yields 4 large or 6 more modest portions. 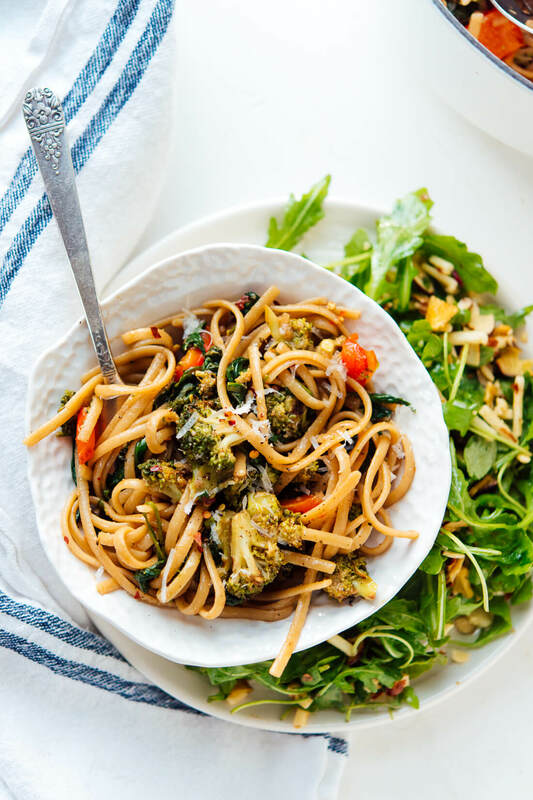 Change it up: Skip the roasted veggies for a simple weeknight pasta that’s full of greens, or change up the vegetables used. Make it vegan/dairy free: Use olive oil instead of butter and omit the Parmesan. This pasta is great without the Parmesan, but you could add a light sprinkle of nutritional yeast for some cheesy flavor, if you’d like. 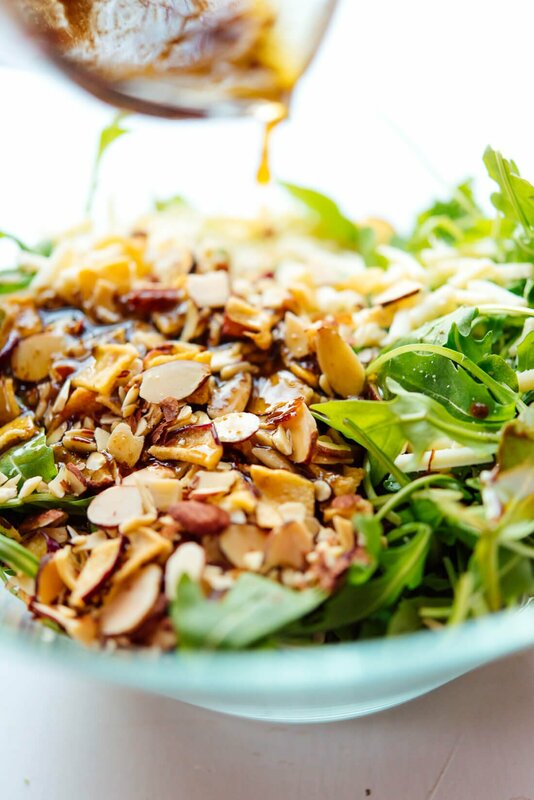 Another option for extra savory flavor would be to add about ⅓ cup freshly toasted pine nuts or sliced almonds. 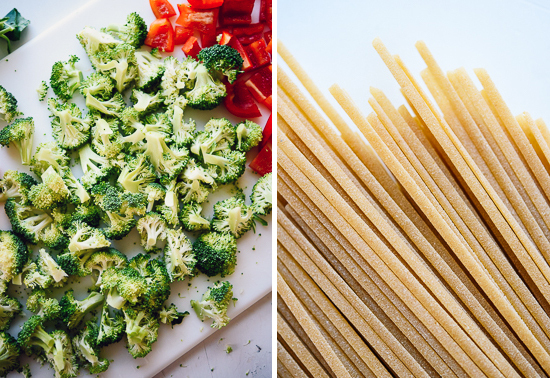 Make it gluten free: Choose a good gluten-free pasta (DeLallo makes one!). I’d I’d love to win the dutch oven. Would be a great Christmas gift to me! 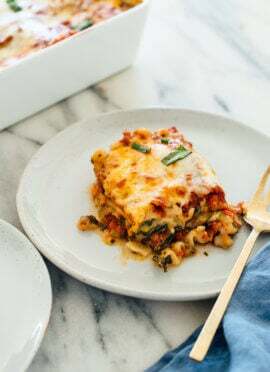 This recipe will definitely be going on my menu plan for next week! You always have the best recipes! And the beet, Apple, and goat cheese Salad Savor sounds so good! Love Le Creuset—hope to be lucky! This pasta dish would be great to make tomorrow before the family members come in for the holidays! I would love to try the Tangy Beets Salad Savors, it seems like we always have fresh greens but never enough toppings for a salad. They all song great! I would be willing to try any of them! Yum! Great recipe! I can’t wait to try it. Pasta looks so yummy and healthy. I’ve never heard of Salad Savors before so thank you for the introduction. They all look quite good. My first purchase would probably be the tangy beet! I love bitter greens with grains, raisins, and mustardy vinaigrette. Yum! The Sharp Asiago SaladSavors sounds best to me! This pasta sounds amazing. The Zesty pack looks so good to top a salad with! Oh man, so many good options with the SaladSavors. But I’ve been on a cheddar and apple kick lately, so I’d love to try those. And this pasta looks so tasty! Would love to try the goat cheese or glazed pecans. I want to try the goat cheese saladsavor! They all sound so good but I love goat cheese! This pasta looks awesome and easy which is what I need this time of year. The balsamic vinegar is magical. I can’t have dairy, but I still think the cheddar, almond, and apple one looks delicious! I think my dairy eating husband would devour it! I used to eat pasta and broccoli as a kid all the time ! This is a great grown up version of it ! Yummy ! I’d love to try the Fresh one. I looooove goat cheese! YUM! Perfectly colored bowl of pasta for the holidays. I’m definitely adding pine nuts to my version for a delicious crunch! Can’t wait to try the Vibrant Blue SaladSavor as well. I’m always looking for ways to sneak in greens. My husband has a “ratio” when it comes to veggies and food. He’s getting better, but still! This looks amazing! I especially love all of the colors. I bet Asiago would be another great option. And in the side salad, the Sharp Asiago sounds great. I guess I really want asiago cheese! Can’t wait to make for holiday dinner. I’d try the tangy beets! Love your blog! I would love to try the Tangy flavor! I would love to try the asiago cheese one!! anything with cheese sounds great! the asaigo, artichoke, sundried tomato sounds right up my alley! I want to try the goat cheese one for the beet salad. Yummy! I would love to try the zesty flavor! Made this tonight and it was delicious. Thanks! I made this recipe with eggplant and green pepper as I did not have any red peppers or broccoli. It turned out great! The flavors were amazing. I will definitely be making this again soon!! Thank yo, Erica! Your version sounds great! I made this last night. Followed the instructions precisely. Divine. I think it’s worth taking the time to roast the veggies. It’s going in my “make again…and again” file. 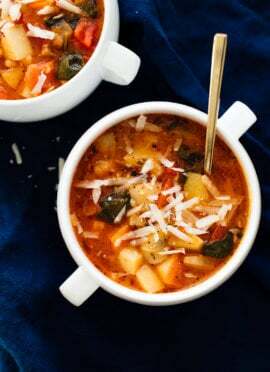 This recipe is a HUGE winner with my family members who all have a different palette of food preferences (one vegetarian & two meat eaters who are leary of most things vegan. I’m an Italian-American health-atarian and do all of the cooking) I must say that EVERY recipe I’ve tried from your blog– especially the roasted cauliflower lentil tacos, the mushroom risotto, the spinach artichoke enchiladas, to name a few– have been enormous hits, and totally satisfying for even my hard-core meat eaters. Every Cookie + Kate blog is a special gift I look forward to. Thank you so much for your work and can’t wait for the cookbook to come out. I am one of your devoted followers!!! Thank you so much, Maria! That means a lot!!! Yummy! I can’t wait to try this recipe. It seems like this dish has a great taste. I made this today and it was delicious! I used red onion instead of shallot, chilli flakes instead of pepper flakes, and frozen spinach. I can’t wait to try some more! I’ve wanted to go vegetarian for years but struggled to find tasty dishes, even from well known cookbooks. I’m really excited about this, thank you! Love that you use real ingredients that I have in my kitchen!!!! One of my favorite dishes! This has become a staple in my household! It’s even hubby approved! I made this for dinner tonight and it was great! I only used 10 oz of spinach and next time I might reduce it to 8 (not a huge fan of wilted spinach). Did not add cheese and it was still wonderful. Thank you for the recipe! Thank you so much for all your yummy recipes!!! Did not like the taste of balsamic vinegar. I will try it again and use a mango pepper jelly for flavor. Let me know how that works out, Pam! I know vinegar isn’t everyone’s cup of tea. This pasta is very light and flavorful right out of the pot, but ends up pretty dry even after about an hour! Any suggestions on how to keep moisture? Hey Ann, does warming the pasta help? You could also add a little more olive oil to loosen it up. AMAZING! So simple but SO good! You’re welcome, Jennifer! Let me know how it goes. Oh my goodness … this was SO delicious!!!! When will Amazon send our cookbook? We can’t wait!! It should arrive promptly on May 16!! SO delicious! Made this last night and couldn’t believe how incredible it was….all of the flavors came through and all were in perfect balance, exactly per your measurements. We are so looking forward to your cookbook and hope it arrives before we leave for a week away so we can enjoy a cooking vacation!! If you’re in the US, it should arrive promptly on the 16th! I’m so glad you enjoyed the pasta, too. Thanks so much, Cathy. Delicious! Whole family loved it, even our toddler! I made this tonight without the roasted veggies and it was delicious! Thank you for a great weeknight recipe that helped me use up the farmer’s market spinach that was languishing in my fridge! Oh no! You can’t let that spinach go to waste. I’m glad you found a good use for it! I Tried it and its super delicious!!!! My family loved it. Thanks for sharing. Its healthy and tasty. Made this last night, it was a brilliant summer veg pasta. I actually roasted the broccoli and red bell pepper on a grill pan on the BBQ, which gave it an additional summery flavor. Excellent recipe! I added zucchini to mine, we had no leftovers!! Thanks for the great recipe. I must say, the pictures are gorgeous! Made it for a family gathering, everyone loved it! I love the use of roasted veggies, it’s tasty and healthy at the same time. However, I’ve used both red and green bell peppers and whole wheat linguini from Rossi Pasta. The flavors were perfect. Definitely a keeper! Well, thank you James! I’m glad it’s a hit for you. I appreciate the review. Great recipe. Simple and delicious! My carnivorous son also liked it. Thank you! This is one of my go-to recipes now when I want something quick, delicious, and filling. Hi, Becky! You’re right- it really is magical. I’m so glad to hear it’s a go-to recipe for you! Star rating of 10 again. Made this tonight. It was fantastic. I plan to! :) Thank you, Karen. Love this recipe because my pasta-hating hubby will eat it! 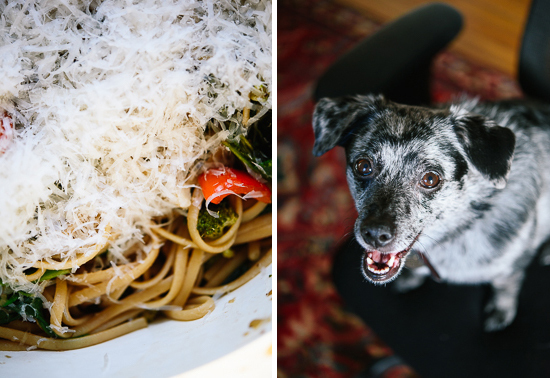 This is a regular in our rotation because I love love love pasta and he doesn’t. Another super easy recipe too btw. I’ve also made this for friends and it always is a hit! I didn’t know there was such a thing! ;) But, I’m glad to hear he likes it. Do you think this could work with curly kale (chopped finely) instead of spinach? We have so much in our garden right now. Not sure if the flavor would be mellow enough, though. Thanks as always for your amazing recipes! Sure! Let me know what you think, Amanda. Made this for my vegan father-in-law tonight. So yummy & not difficult to make! Thanks! Is there any substitute for shallots? I’m not sure if I can find them here. You can use some onion, but it will be a little more potent. Let me know what you think! Just made this last night and my family and I loved it. Since I did not have all the ingredients I used what I had and it still came out good. I used a vidalia onion, a yellow pepper, squash, asparagus and the broccoli. It is definitely a recipe I am making again and can’t wait to switch up the veggies. Thank You! I’m glad it came out for you and your family loved it, Allyson! Thanks so much for taking the time to comment and review. Yet another hit from cookie and Kate! Keep these vegan recipes coming! Everything of yours I’ve cooked has been loved by everyone! The flavours are amazing. Thank you for sharing this easy recipe. It is so delicious. Welcome! I’m glad you for sharing. What an easy, yummy recipe to whip up on a weeknight! Love how healthy this meal is! You always have the best recipes! I never feel guilty about eating seconds, because I know I am eating something that is clean and healthy. I made this with fresh pasta and WOW. 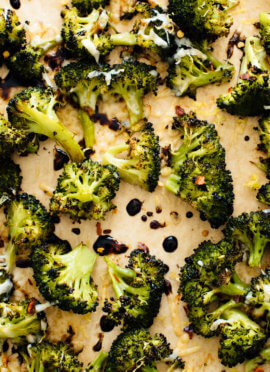 My wife is the only vegetarian in the fam, but my kids really loved this recipe. Light, fresh, healthy and super yummy. Really easy to make too. Will definitely be a go to recipe. If you’re a man cooking for a woman, this recipe will make you look like a seasoned pro with preparation and flavor.